As I write this letter, albertapatients.ca has just had its first anniversary. We launched on June 12, 2015. Today, we have 3,000 members and the community is growing steadily. We plan to become much larger still because word is spreading that, if you’re interested in what Albertans think about health care, this is the place to come. In the last year, we’ve talked about issues that you said matter. An excellent example: mental health. This was one of the first topics to emerge as an area of interest last summer. That’s why we took the opportunity to engage the group to think about and review the work of the provincial mental health review conducted by the Alberta government in the final months of 2015. When we shared with you the report that was issued following the review, you had thoughtful things to tell us and insight to provide. Please see the results, below. The AMA Board of Directors has watched the evolution of albertapatients with interest and enthusiasm. Your input has been instructive in our deliberations. Now that the community has grown to a very respectable size, we will be pushing results out to other organizations in the health care system. 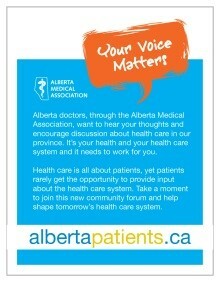 The voices of the members of albertapatients will be heard ever more widely in the year ahead. So Happy Anniversary to the community. Thank you for all your support and I look forward to what happens next! In 2015, the Province of Alberta formed a Mental Health Review Committee, co-chaired by Dr. David Swann, Liberal Leader, and Lesser Slave Lake MLA Danielle Larivee, to undertake a review of mental health services. The review process included public and stakeholder engagement, and concluded with the development of recommendations and a final report. 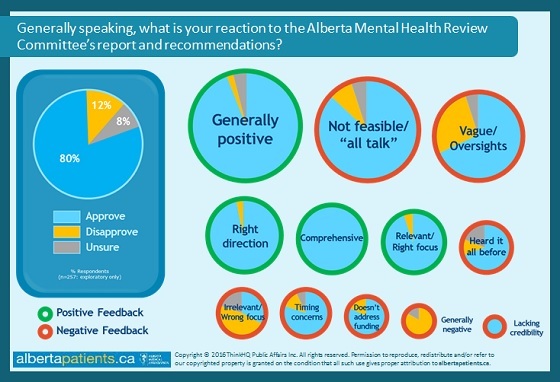 Although albertapatients was not affiliated with this review in any way, many albertapatients members have expressed interest in discussions around mental health and we were very interested in your perspectives, opinions and feedback on the report and its recommendations. Please read on to the Did You Know section (below) for highlights from that research and a link to the full report. Patient views on the Alberta Mental Health Committee's report and recommendations. Did you know? Overall, the majority of albertapatients members who responded to our feedback survey approve of the report and its recommendations. Fully 4 in 5 told us they approve, while 12% said they disapprove and 8% were unsure. Although albertapatients members are mostly supportive of the Committee's effort, many are uncertain about or disagree with the report's focus. 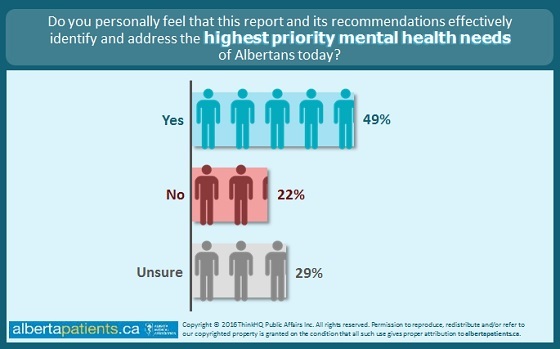 Compared to 80% who said they approve of the report and recommendations, only 49% agree that the highest priority mental health needs of Albertans today have been identified and addressed (29% were unsure and 22% told us that the highest priority mental health needs were not addressed). When asked for general reactions to the report, albertapatients members were largely positive – but even supporters raised doubts and concerns. Although generally positive feedback was the most frequently observed reaction, it was followed closely by questions about feasibility/whether or not it is "all talk" and concerns about vagueness and oversights. Addiction, early intervention, homelessness, and support for First Nations and youth were some of the most frequently mentioned strengths, while timing, vagueness, expense, gaps, education, seniors, staffing, follow-up, and accountability were often mentioned as weaknesses.